Google has introduced a new ‘auto rickshaw’ mode in Maps to help commuters find their way around in Delhi. 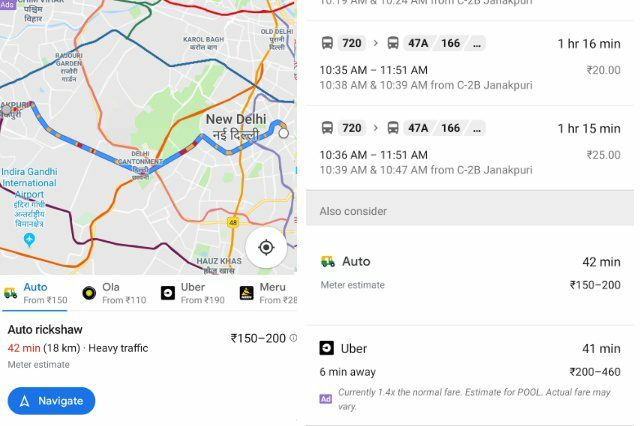 The mode, as its name suggests, will help commuters plan their trips better by providing route details and the estimated cost of an ‘auto rickshaw’ ride. It comes with the latest version of Google Maps and can be accessed right away. How ‘auto rickshaw’ mode provides fares? The auto mode uses the length of a given route and the official fare model provided by Delhi Traffic Police to calculate the estimated or expected fare of an auto rickshaw ride. This will not just save commuters, on an unfamiliar journey, from being fooled into paying higher prices but also help them compare auto charges with those from popular ride-hailing services. Along with fare estimate, the auto-mode even shows the best route and estimated ride time, helping the commuter determine whether they want to go all the way on an auto or use some other mode of transportation instead. How to use ‘auto mode’? To use auto mode, open Google Maps and search for the location you want to visit. Then, hit the ‘Directions’ button to get various available modes of transport to reach that place – Car, Bike, Public Transit, or Cabs. When you hit the tab for public transport or cabs, you’ll find the auto option with fare and time estimate for the chosen route. Before you start searching for this option, update your Google Maps’ app to the latest version. Also, make sure that the route you select for using auto mode should be within the boundaries of Delhi. The feature doesn’t work outside Delhi and Google has not said when we can expect it in other cities.